This simple and plain calendar makes it easy for you to edit and customize your fitness schedule and print it out so you can continue with your workout for that day. The template is structured as an easy to read calendar, just glance at the current date and you will know what workout you pre-planned for that day! You can even use the workout calendar to enter different workout classes at your gym. 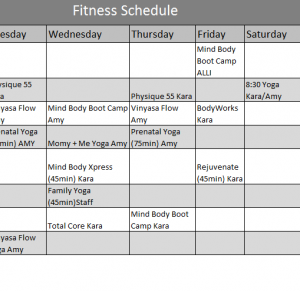 Perhaps you want to schedule cardio and the next day attend a fun looking yoga class. This template makes organizing your fitness strategy as easy as possible. Start by entering the times you have set apart for your workout routine. There is a column to the far left of the page where you can enter the specific hours you plan to exercise. The next seven columns are for organizing the days of the week. Now you can go through each day of the month and plan out the specific exercises you want to include for that day. The template has provided you with a list of examples to get started. To change these pre-written examples just click in the cell you want to change and start typing in your own workout information. When everything is ready to go and you have your Fitness Calendar filled, you are ready to print! Click the “File” tab at the top of the screen and select “Print” from the following drop-down menu. You can take your new workout calendar and place it wherever is most convenient for you. The Fitness Calendar is designed to help keep track and monitor your workout. Right from the moment you wake up you’ll have everything you need to head to the gym and accomplish your exercising goals for the next month. The Calendar Template has the tools you need to stick with your routine and be that much closer to your ideal weight!